One of my favorite appetizers and snacks to fix at Christmas time is sausage balls. I really enjoy baking some and sitting down to watch a Christmas movie and snuggle under my blanket. These are great for snacks, appetizers, and I also use them at breakfast as a side for my scrambled eggs. These sausage balls are easy to make and a healthier version than using traditional sausage. This recipe makes approximately 30 sausage balls and I usually freeze them on a tray and then store in a freezer bag until I want to fix a few or fix the entire bag! To start off this recipe, you will need to make some turkey sausage using ground turkey. That recipe can be found here. It is really a simple recipe. 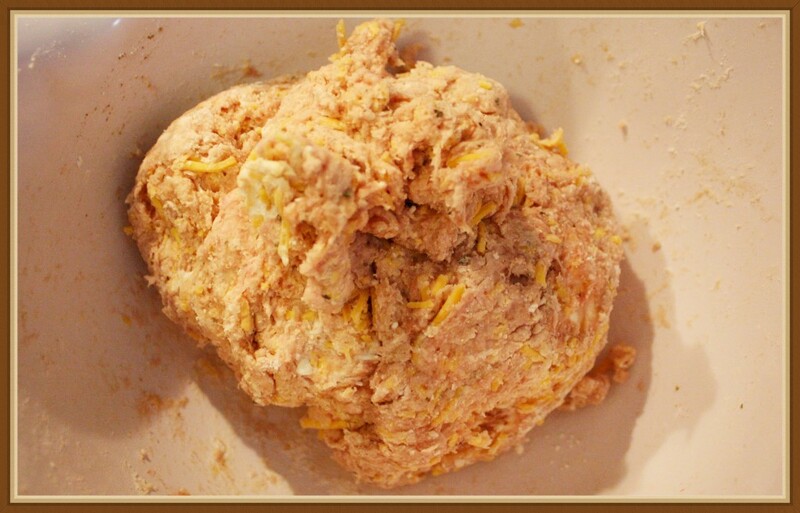 Once the turkey sausage is mixed thoroughly, add in the ingredients for the sausage balls: Bisquick, cream cheese, and grated cheddar cheese. I have used mild, sharp, and a mixture of both before. Roll out the sausage balls. I place mine on a cookie sheet lined with wax paper and then place them in the freezer. I let them get frozen and then place them in a freezer bag until I need them. When you are ready to serve, place them on a greased baking sheet and bake at 400˚ for approximately 15 to 20 minutes, depending on your oven. 1. 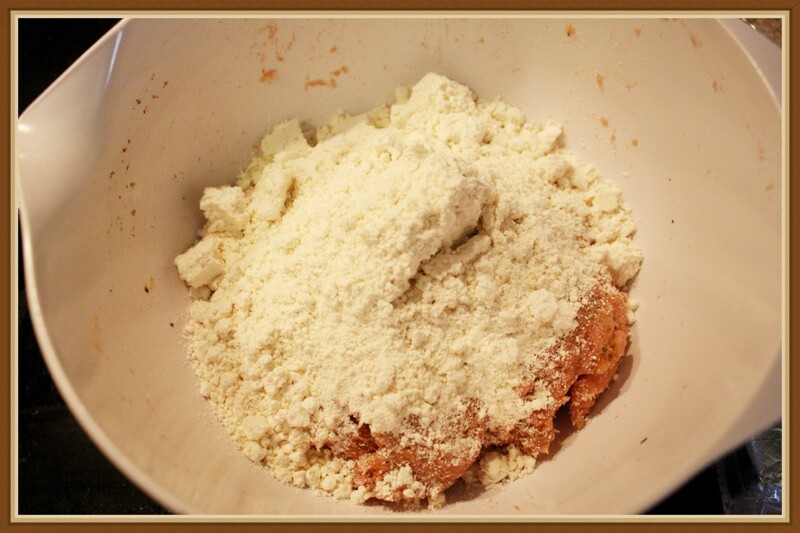 Mix all ingredients together thoroughly in a bowl. It is best to use your hands to mix the cream cheese evenly. 2. Roll the mixture in to 1 inch balls. 3. If not serving immediately, place the balls on a baking sheet lined with wax paper. Place in the freezer for a few hours. 4. 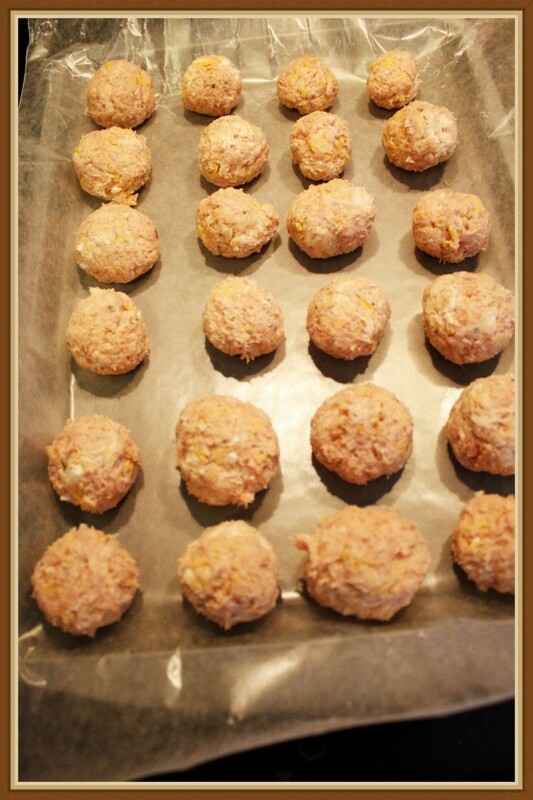 Store the sausage balls in a freezer bag and remove when ready to cook. No need to thaw. 5. Bake at 400˚ for 15 to 20 minutes. These look amazing. I love making my own sausages. I know whats in them that way and they always turn out tasting so much better. That’s why I started making my own turkey sausage so that I would know what was in it. 🙂 It does taste MUCH better than buying it. Thank you for stopping by. This is very similar to a recipe from my mom, but hers doesn’t include the cream cheese, which I think is a brilliant addition. I have to make these in the minutes before guests come over–otherwise I eat them all. Cheers! The cream cheese helps to keep them moist I have found. I tend to eat them all too – I keep them in the freezer when I make them and then pull out a few at a time. Thank you for stopping by! I was looking for an easy dinner tonight too! Thanks for hooking up to the Hump Day Hook Up! I’ve never made turkey sausage balls like this before. Mine are more like meatballs. Great recipe! Great recipe! 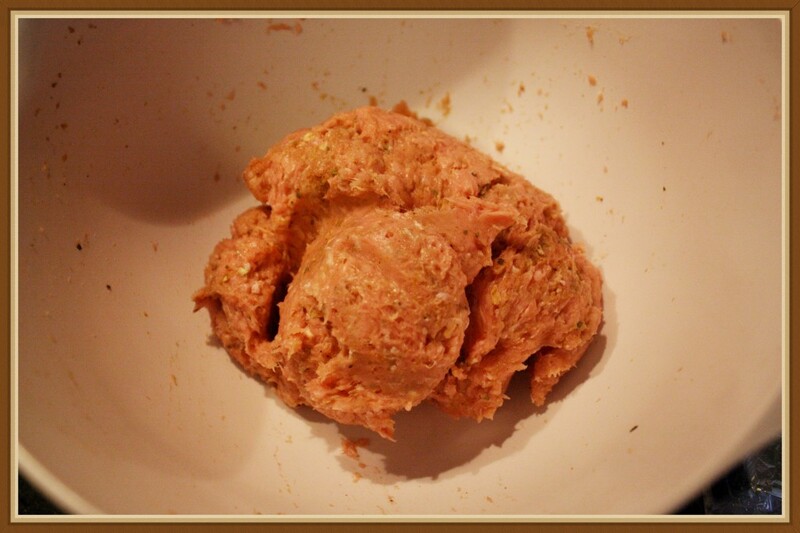 Pinned it and love that you made your own turkey sausage.